by Murdaugh, Carolyn L.; Parsons, Mary Ann; Pender, Nola J. For undergraduate and graduate courses in health promotion and disease prevention. 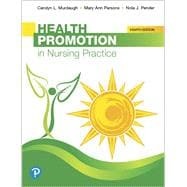 Health Promotion in Nursing Practice gives nurses and other health care professionals a practical, evidence-based guide to promoting health within diverse racial, ethnic, cultural, and economic populations, across the lifespan. It discusses individual and community models guiding health promotion interventions, strategies to implement and evaluate programs, and the evolving role of digital technology in improving efficacy. Learning activities and resources challenge students to think creatively to advance the field of health promotion. The 8th edition focuses on increasing access to innovative health programs for all populations, especially those most vulnerable, and on promoting active self-care for individuals and communities. Carolyn Murdaugh, RN, PhD, FAAN, is adjunct professor and Professor Emerita at the University of Arizona, where she was Associate Dean for Research. She has held research and research administrative positions at the National Institutes of Health and the University of South Carolina. Her clinical and research interests have focused on promoting health and quality of life and reducing health inequities in diverse populations, including adults with cardiovascular disease, women with HIV/AIDS, Japanese American caregivers of elderly men with dementia, and Mexican Americans with type 2 diabetes. In addition to Health Promotion in Nursing Practice, she has co-authored three other books: Patient Centered Care: A Model for Restructuring (Parsons & Murdaugh), Strategies for Improving Patient Care: A Guide to Clinical Resource Management (Parsons, Murdaugh & Jarrell), and Interdisciplinary Care Studies in Health Care Redesign (Parsons, Murdaugh, & O’Rourke). Mary Ann Parsons, RN, PhD, FAAN, is Distinguished Professor Emeriti and Dean Emeriti at the University of South Carolina, where she was dean of the College of Nursing. Her clinical and research interests include health promotion, primary care, and community health with a focus on health behaviors of rural adolescents and working adults. She has contributed to books on community health, distance education, faculty practice, and nursing education.